It is estimated that 20 percent of the underground fuel tanks in the U.S. are over the age of 30. As these tanks age, owners/operators of these fuel facilities need to have a good idea of how long their fuel tank is expected to last. Having a good record of when your fuel tank was serviced can also be helpful. If you have a clear idea of what sort of problems you have been having, it can help you decide whether to maintain your fuel tank or remove it. 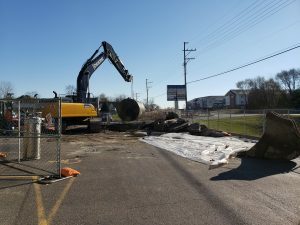 Removing Underground Storage Tanks like those found at gas stations or commercial fuel facilities can be a very serious task that requires expertise on many levels. Having the right equipment and the right people to preform the work is what sets Eagle Environmental apart from most consultants. From beginning to end, Eagle can handle the entire project from tank removal or abandonment to the environmental consulting. We can remove various types of underground storage tanks and all associated piping. From 500 gallon used oil tanks to 40,000 gallon heating oil tanks and everything in between. The professionals at Eagle Environmental Consultants have over 25 years of tank removal experience. Our reputation with the state of Illinois regulatory agencies such as the Illinois State Fire Marshal and the Illinois Environmental Protection Agency is second to none. Owner/operators of fuel facilities throughout the state of Illinois have relied upon Eagle Environmental Consultants to handle the entire process from removal all the way to NFR (No Further Remediation) letters. In some instances an underground storage tank due to its proximity to a building, underground utilities or canopy cannot be removed. In these cases the tank must be abandoned in place. For any of your Underground Storage Tank Removal & Abandonment Chicago Illinois please contact us to see how we can utilize the Illinois LUST Fund to help you pay for your Tank Removal or Abandonment.